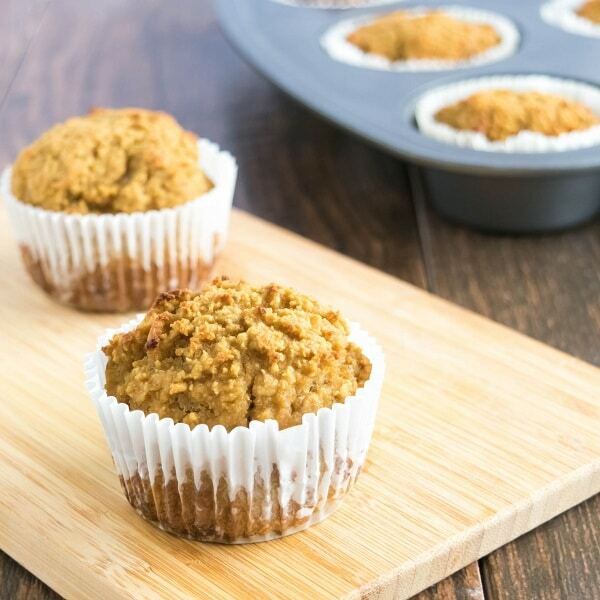 Fresh pears and flaxseeds meal mixed in with coconut flour and baked into soft and moist muffins! I have been tossing quite a lot of grain free muffins recently in my attempt to come up with proper texture and taste. After weeks trying, I finally created Grain Free Pear Flax Muffins the way I wanted it to be. Soft, Moist, flavorful, No crumbles and to my satisfaction!! My daughter is crazy after pears and I have been trying to create a healthy dessert out of pears and I had a bag full of coconut flour. Coconut flour is high in protein and fiber. It is wheat free, gluten free and paleo friendly. It’s a perfect food for the gluten allergen and has essential amino acids. Coconut flour reacts slightly different when baking as compared to traditional grains so you may want to follow the recipe exactly. I added Golden Flaxseed Meal due to its health benefits. Flaxseed is super food which helps in lowering cholesterol and high blood pressure, its gluten free and paleo friendly. It helps in enhancing immunity system and increases energy and vitality. Grain Free Pear Flax Muffins are high in fiber, has required omega 3 fatty acids and good fats, good amount of protein with lots of flavor. It’s a perfect guilt free indulgence dessert to satisfy your sweet tooth. Preheat the oven at 375 degree Fahrenheit and prepare the muffin tray. Remove the middle seed from the pear and grind it along with the skin as finely as possible. Add all the wet ingredients in the food processor along with the pear and process for few seconds or until smooth. Pour the liquid ingredients into the dry ingredients and mix well with a spoon until the batter is smooth. Spoon the batter with an ice cream scoop into the muffin tray and bake for 25 minutes or until the tester comes out clean. Take it out of the oven and serve warm or at room temperature. Flax oil can be substituted with olive oil. You may use any flaxseed meal if desired. Can be stored in an air tight container in the refrigerator for 3-4 days. I made these today to try them out. They taste good… but not like pear. Mine probably taste most like almond. Since I’m allergic to vanilla, I used almond extract instead, but I suspect that otherwise they would have tasted like vanilla muffins. I bet these would be great with some berries stirred into the batter or some chopped nuts. Hi Brandy, thanks for trying this recipe. If you use almond extract the taste would completely change because almond extract has a very strong flavor of almond. Had you used vanilla extract the flavor of pear would have enhanced and you would have got some mild flavor of pear. Vanilla extract is used to sweeten the dessert and for certain dessert like flavor and in this recipe its used for this purpose. Usage of vanilla extract does not make this recipe vanilla muffins in any case because of the small measurement. If you are allergic to vanilla you could just avoid any extract and just adjust the sweeter a bit according to your taste. I would not suggest adding berries otherwise the flavor of coconut would die. Hope this helps.